Broughty Castle occupies a superb location. It stands at the tip of a shallow point projecting into the mouth of the Firth of Tay from the attractive town of Broughty Ferry, four miles east of Dundee. It is free to visit and, as well as being interesting in its own right, offers magnificent views over Broughty Ferry and along and across the Firth of Tay. In 1454 the 4th Earl of Angus was granted permission by King James II to build a castle here. It is unclear what form this first castle took or how large it was: it may not have been very substantial. In 1490 the second Lord Gray was given permission to rebuild the castle. Judging by a date that is recorded as having been inscribed on the wall of the castle until later alterations, this took until 1496. At this point the castle comprised a four storey plus attic tower house, complete with a wall walk at the top. This stood on the landward side of an irregularly-shaped walled enclosure that had additional smaller towers at its north east and south west corners. In common with other similar castles being constructed at the time, the main hall of the castle was on the first floor of the tower, above vaulted stores and a kitchen. 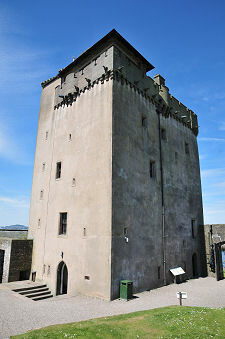 The upper two floors of the tower provided bedrooms, while additional accommodation was built against the inner walls of the enclosure to the south. 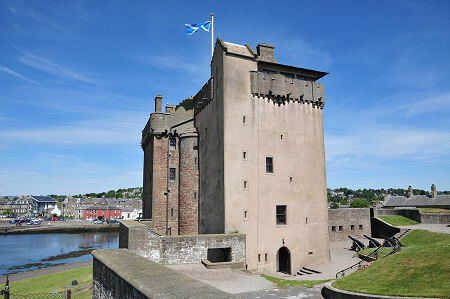 Broughty Castle featured most centrally in Scottish History in the three years up to 1550. In 1547 Lord Gray was a supporter of the invading English army against the Catholic cause of the infant Mary Queen of Scots (see our Historical Timeline). 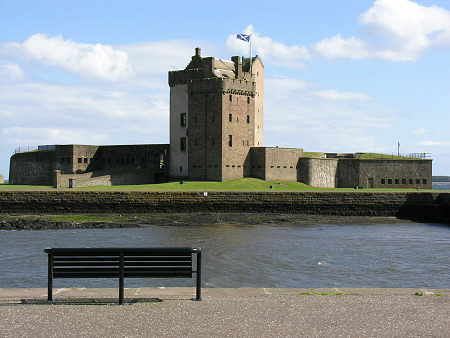 The English arrived by sea at Broughty Castle on 20 September 1547, two weeks after they had defeated the Scottish Army at the Battle of Pinkie. The castle was surrendered to them, and the English immediately set to work on improving its fairly weak defences, mainly by digging a defensive ditch across the landward approach to the castle. 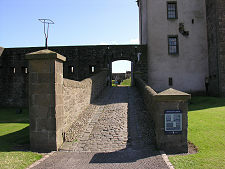 Some 3,000 Scots troops arrived on 22 November 1547, but despite destroying parts of the tower they were unable to recapture the castle. The English strengthened their hold on the area over the following months, at the same time as the Scots and the supporting French built up their forces in Dundee. On 20 February 1550 the French and Scots succeeded in capturing a subsidiary fort also held by the English a short distance to the north on Balgillo Hill, and the following day Broughty Castle surrendered to them. The damage to the castle was repaired and the Grays moved back in for a relatively tranquil hundred years. But in 1651 the family were backers of the Royalist cause in the Civil War, which resulted in General George Monck and his Parliamentary army attacking the castle on 31 August. The defenders fled without a fight. The Gray family sold Broughty Castle in 1666 and it slid slowly into obscurity and decay over the following century. It played no part in the turbulence of the 1700s, and was described as a ruin in 1787. A drawing made in 1807 shows a roofless shell. Despite this it was advertised for sale in 1821 on the basis that repairs would be inexpensive. In 1846 the castle was purchased by the Edinburgh and Northern Railway Company, who then built the Broughty Ferry Railway Quay immediately to the west for the railway ferry used to transport trains across the Firth of Tay. This formed part of the rail link between Edinburgh and Aberdeen until the completion of the Tay Bridge in 1878, and again from the bridge's collapse in 1879 until its replacement was completed in 1887. With the growing fears about a threat from the Russian navy at the end of the Crimean War, Broughty Castle's strategically important location came to the fore again. It was purchased by the War Office in 1855. Nothing further was done until 1860, when, in response to fears of a war with France, work began on a major refortification of the castle. The work was carried out to the design of the architect Robert Rowand Anderson, and although the core of the 1490s tower house remained, much of the rest of the structure and the surrounding area was changed significantly. In 1886-7 a new barracks was built immediately to the east of the castle to house the submarine miners whose job it would be to lay mines across the Firth of Tay in the event of war. One of the buildings added at that time still stands. Further changes were made in 1889 to 1891; during the First World War; and during the Second World War, when a lookout post was added to the top of the tower house. 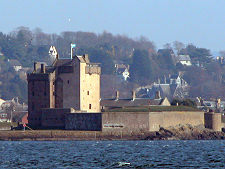 In 1969 Broughty Castle opened as a museum operated by Dundee Council. The museum continues to be run by Leisure & Culture Dundee, while the structure of the castle itself is in the care of Historic Environment Scotland. 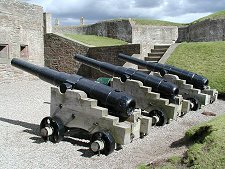 As you enter the castle you are confronted by a row of three cannons. These are extremely rare rifled breech-loading 40-pounders made by the Armstrong company and probably installed in the castle in the 1860s. At some later point they were removed and buried, breech down, in the nearby pier, with the top three feet of their barrels protruding to form bollards. It was only in 1989 that a passer-by realised what they were, and the cannons were excavated and restored the following year. 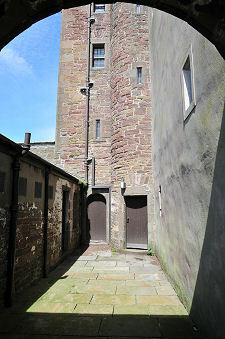 The museum occupies the upper four floors of the tower house. On the first floor, which is also home to the reception, you find an exhibition about "Broughty Life", which looks at the history of Broughty Castle and Broughty Ferry and includes some excellent models of the railway ferries. The second floor is an exhibition space for part of the art collection of James Guthrie Orchar, who was one of Dundee's most prominent businessmen in the late 1800s. On the third floor you find "Broughty Life on Land", a highly interactive exhibition covering the natural history of the area. The top floor is home to "The Military Gallery", which tells the story of the castle's military past. From the top floor you can move through to the lookout post added to the top of the castle during the Second World War, the high point, literally, of your visit. The Castle is in the care of Historic Environment Scotland and the museum is run by Leisure & Culture Dundee.